The machine is capable of welding up to 45 Cross wires per minute. This speed is dependent on numerous factors including, but not limited to, quality and consistency of material, line bar sizes, cross wire diameters, maintenance of the machine and operator abilities. The line would typically require two operators at the loading station and one at the welding portal/crosswire magazine. Other operators may be required for material handling to and from the machine. 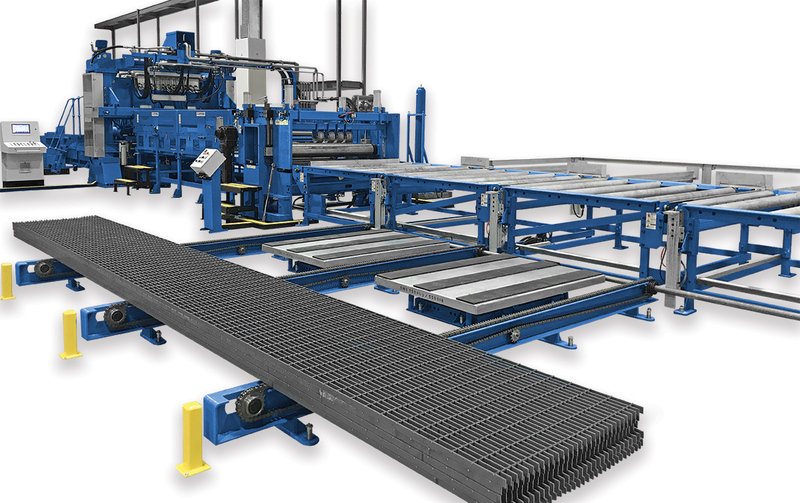 Many options are available including off coil load bar and cross wire systems, integrated shears and cutting systems. Load bar length: Min. 9000mm / 354.33"
Load bar pitch Variable from 11mm / 0.43" — 50mm / 1.97"
Crosswire pitch Variable from 25mm / 0.98" — 100mm / 3.94"
Cross wires Twisted square 4mm / 0.157" — 10mm / 0.394" across flats.